During our last visit to South Africa, Olivia and Carter were introduced to an amazing lady (Karen Trendler) who works with orphaned baby rhinos. By partnering with various organizations who are working on the frontlines in the fight to save rhinos, we have learned of the need for several “Rhino Ambulances”. 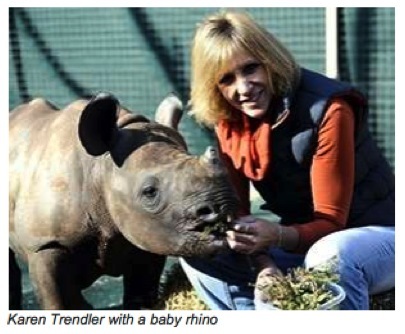 “And within days of its arrival we used it to help rescue a little calf whose parents were both poached. It’s almost impossible to thankOSCAP and their supporters enough. And it’s great to know there are people like CMA who care so much about our work in this vitalcause”. 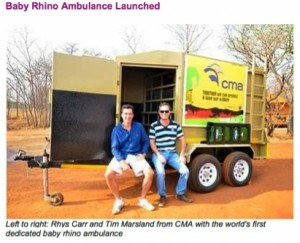 The ambulance is fitted with a range of specialist equipment including: White and red lights; a generator for on board electricity, two-way radios for communication between trailer and driver; rubberised and padded interior; a section in the nose cone, which has a barrier between the “carer” on board and the rhino – this barrier can be lowered for easy access to the rhino and to protect the carer who can extend the height of the barrier; hooks for drips and feeding; and power points for electricity for cell phone charging and to run other equipment. The orphanage has specialist medical facilities to care for these often extremely young and badly injured animals, giving the babies the very best chance of one day returning to the wild where they belong. 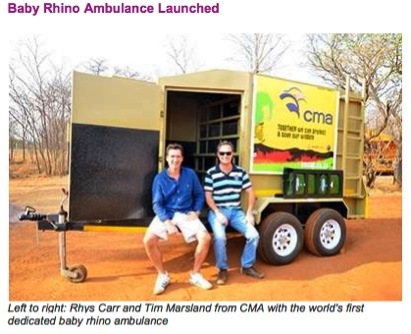 A Rhino Ambulance sounds like a whimsical notion from a children’s storybook, but in fact it’s the latest innovation from the front lines of the poaching crisis. Often after their mothers have been killed by poachers, rhino calves stay close to the corpse; most orphans die from dehydration or injuries. Rescuing calves from such situations is problematic: when they are transported to a rehabilitation venue the young rhinos are at high risk of further injury and going into shock – a common cause of death when wildlife is handled and transported. For this reason, the rhino conservation organisation Outraged SA Citizens Against Poaching (OSCAP) saw the need for Rhino Ambulances – specially designed trailers for transporting calves from poaching incidents as calmly and comfortably as possible. Renowned wildlife rehabilitation specialist Karen Trendler advised on various modifications, which include air conditioning, soothing red lighting and hooks from which to hang drips. The walls of the ambulance are lined with rubber matting to help prevent further injuries to the orphans if they panic once inside. Each equipped Ambulance costs around R100,000.00 (approximately $10,000 US dollars). Individuals and companies interested in sponsoring this initiative can contact Allison Thompson of OSCAP (+27 74 1040208). You can also support OSCAP on Facebook or contact any one of us directly. OMG is in the process of raising enough funds to support this initiative. All funds raised will be given to OSCAO (Outraged SA Citizens Against Poaching) for the continuation of the project. Just click on this link DONATE and specify your donation should be applied to the Rhino Ambulance Project.